Swayne’s Hartebeest lives in open country, light bush, sometimes in tall savanna woodland. These are social animals and are normally seen in herds of 4 – 15, up to thirty. Each herd is under the leadership of the master bull which leads the females with their young. The territory is defended by the male; you may often see them grazing peacefully, with the bull on slightly higher ground acting as sentinel for his herd. The small surviving population is now restricted to the grass and thorn scrub plains of southern Rift Valley lakes region, especially the Nechisar National Park has been established for their protection, located in the southern part of Ethiopia 505km from the capital on the shores of the rift valley lakes of Abaya and Chamo, and can easily accessible from Arbaminch. The best known herd is about 100 head which inhabits an area of 400 sq km near the shore of Lake Chamo. However, the largest known population is on the heavily settled plain of Senkela Swayne’s Hartebeest Sanctuary in the Shashemane area 250 km from the capital. Here there are probably about 500 now in excellent condition but less likely to survive because of pressure on habitat. This hartebeest is listed by the IUCN among the species in the world in “imminent danger of extinction” and is completely protected in 1972 by law in Ethiopia wildlife Conservation. Pressure on its habitat by human beings was the main cause of its decline, and it is to hope that with the creation of the national park and rigorous enforcement of the protection law, this beautifully colored antelope will start to recover its numbers. Endemic to Ethiopia, Walia Ibex, formerly widespread in the northern mountain massifs, but now restricted to the Simien Mountains National Park, where it is uncommon but quite often seen by hikers. 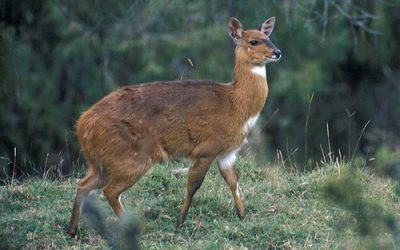 Ethiopia’s one fully endemic antelope species is the Mountain Nyala (Tragelaphus Buxtoni). The mountain Nyala is similar in size and shape to the Greater Kudu but it has smaller horns with only one twist as opposed to the greater Kudu’s two or three. The shaggy coat of the Mountain Nyala is brownish rather than plain grey, and the striping is indistinct. This elegant and handsome antelope live in herds of five to ten animals in juniper and hagenia forests in the southeast highland. This beautiful animal was once widespread over the Ethiopian plateau lands and was often observed by travelers with its fine red coat shining in the sun, making it easy to spot against the greens and browns of the grasslands. Its frightening decline in numbers is due not only to indiscriminate shooting, but also to outbreaks of rabies, which certainly decimated its numbers in the Simien area. In this part of Ethiopia it is now extremely rare, even rarer than the Walia Ibex, but it has another stronghold, in Bale, which the Walia doesn’t. The striking and unmistakable most common of Ethiopia’s endemic large mammal species, with a population estimated by some to be as high as 700,000. The male Gelada is a spectacular handsome and unmistakable beast, possessed of an imposing golden mane and heart shaped red chest patch, which serve the same purpose as the colorful buttocks or testicles found on those African monkeys that don’t spend most of their lives sitting on their bums. Giant Mole rat (Tachyoryctes macrocephalus), also known as the giant root rat, plays a much more serious role in the ecology of the Afro alpine communities of Ethiopia. It is endemic to Ethiopia, where it is confined to high altitude shrub and grasslands in the Afro alpine habitat of the Bale Mountains (3000 – 4377 meter). Their present distribution may be only a fraction of their former range as a result of their specialization to montane habitats, which are shrinking, as well as to increased isolation between populations.